I admit that I depended quite a lot on die cuts for my cards this year. That's because 1) I enjoy using them and the results they give; and 2) my Big Shot was still available for my use. 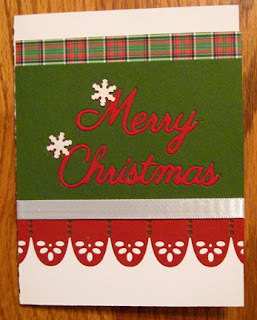 I cut the "Merry Christmas" from both red and green cardstock, removed the cut from one color and inserted it into the other. I dislike it when the center of the letters aren't included so I was careful to save those little pieces and get them in place. The snowflakes were punched and the border was die cut. I added a strip of narrow ribbon for some variety in texture. Merry Christmas to all!